– Adaptable design for cozy seating, heated floors, beds, greenhouses, and more. 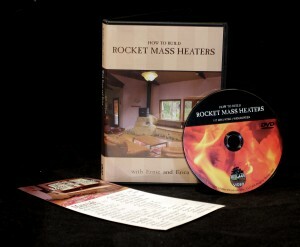 Erica and Ernie Wisner have been designing and building rocket mass heaters since 2003. They are the recognized experts at designing these heaters for a wide range of conventional and off-grid buildings, and authors of The Art of Fire and The Rocket Mass Heater Builder’s Guide. Download a free materials list and brick layout guide! I just received my DVD today! I was so excited!!! I opened it immediately and popped it into my laptop, and grabbed a glass of wine to watch and learn! Thank you! THANK YOU! … for all your months/years of effort producing this DVD for us interested amateurs/dreamers! (and I’m a mechanical design engineer, and I approve). You’ve done a really fantastic job, I really love your DVD! Please share my positive feedback with your entire team! A thousand Thank Yous! I feel blessed and grateful to be learning from your experience! Watched the new RMH DVD from Village Video! It details the process of Ernie and Erica building this (now famous) installation over a hardwood floor. This is the most comprehensive, informative source I’ve seen yet! I now feel much more confident moving forward with my project. Thank you, Calen Kennett for producing this masterpiece. It will help many people realize their dreams of building a sustainable heating source for their homes. I recommend this DVD to anyone who is interested in this technology.